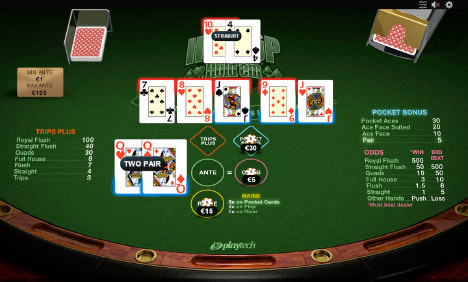 Heads-Up Hold’em is the perfect game for any poker enthusiast to sit back and go on a rush. Taking the casino classic and giving it a couple of fun add-ons, this new table game here at Fly Casino is not only perfect for desktop players, but also perfect to play via our download version. Players must place an ante and odds bet (odds bet must be equal to the size of the ante). At this stage, both the dealer and player receive two cards each, while five community cards are dealt in the middle of the table. All cards are face-down. First decision is to raise 3X your ante or check to see the first three community cards. This procedure continues until all the cards are exposed and the best hand wins up to 500X. The bad beat pot allows players to win up to 500X their odds bet if you lose with a straight or higher. Pocket Bonus has wins worth up to 30X for two starting cards that form a pair, ace + face or pocket aces. Overall, when it comes to tactics, bonuses and big wins, Heads-Up Hold’em is head and shoulders above the competition. $40 gets $60.00 X 2! On Sunday from 00:00GMT until 23:59 GMT, all members on their deposit of just $/£/€30 or more will receive a 100% bonus up to $/£/€100.00. Claim 2X. 100% Up to $200.00! From 00:00GMT until 23:59 GMT, all members on their deposit of $/£/€30 or more will receive a 100% bonus up to $/£/€200.00. 133% BIG TUESDAY! From 00:00GMT until 23:59 GMT, all members on their deposit of $/£/€30 or more will receive a 133% bonus up to $133.00 bonus.